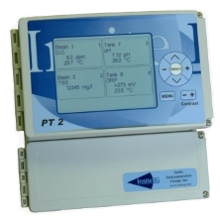 The Insite Instrumentation Group Process Transmitter (PT 2) multi-channel analyzer is part of the unique 20 Series System that combines advanced electronics with the latest in sensor technology. The PT 2 will wirelessly communicate with up to 16 Sensor Transmitters (ST 2) which work with any combination of DO, SS, pH, or ORP sensors. This system allows for flexible and economical process monitoring and control. The PT 2 has an outdoor line of sight range of up to 1500 feet. If the PT 2 is mounted indoors, the closest ST 2 should be within 600 feet. The PT 2 and its sensors form a ZigBee compliant RF network with self-healing mesh technology. This ensures trouble-free communications. This significantly reduces installation costs as there is no need for interconnecting cable or conduit. The back lit display can be programmed to show one, two, four, eight, or sixteen sensor readings continuously. If only one channel is displayed a trend graph of the last twenty four hours for that sensor will also be displayed. All sensor status and readings can be sent to the SCADA system or to a PLC via the two wire RS485 ModBus output. PT 2 setup is simple, requiring only two settings to start wireless communications with a remote sensor. The PT 2 ID setting which is used to identify a PT 2 unit, and the Sensor Address which is used to identify a ST 2 unit. You can use the 20 Series Installation Worksheet to keep your settings organized. See our sensor selection below to match a sensor with your needs.